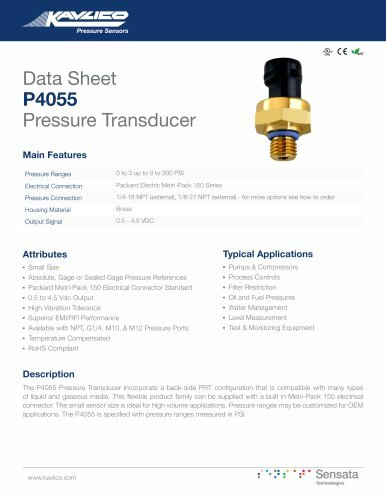 Data Sheet P4055 Pressure TransducerMain Features Pressure Ranges Electrical Connection Pressure Connection Housing Material Output Signal 0 to 3 up to 0 to 300 PSI Packard Electric Metri-Pack 150 Series 1/4-18 NPT (external), 1/8-27 NPT (external) - for more options see how to order Brass 0.5 - 4.5 VDC Typical Applications ■ Pumps & Compressors ■ Process Controls ■ Filter Restriction ■ Oil and Fuel Pressures ■ Water Management ■ Level Measurement ■ Test & Monitoring Equipment Attributes ■ Small Size ■ Absolute, Gage or Sealed Gage Pressure References ■ Packard Metri-Pack 150 Electrical Connector Standard ■ 0.5 to 4.5 Vdc Output ■ High Vibration Tolerance ■ Superior EMI/RFI Performance ■ Available with NPT, G1/4, M10, & M12 Pressure Ports ■ Temperature Compensated ■ RoHS Compliant Description The P4055 Pressure Transducer incorporate a back-side PRT configuration that is compatible with many types of liquid and gaseous media. This flexible product family can be supplied with a built in Metri-Pack 150 electrical connector. The small sensor size is ideal for high volume applications. Pressure ranges may be customized for OEM applications. The P4055 is specified with pressure ranges measured in PSI.